'CONDITION FOR MAXIMUM 1} IF THE ANGULAR RADIUS OF THE EARTH (PI IS CONSTANT. missions, it is necessary to measure as many existing systematic errors as possible. Although the existence of systematic errors can usually be revealed from the behavior of the single-frame attitude solutions, it is our experience that making a quantitative determination of the individual systematic errors solely from this behavior is almost impossible. Hence, in addition to deterministic-type attitude systems, we need techniques and systems which provide the capability of determining systematic errors without relying solely on operator evaluation. Such bias determination systems have become a standard part of most attitude systems in use at NASA's Goddard Space Flight Center. In bias determination systems, the attitude parameters and the most commonly encountered systematic errors are treated as the components of a general state vector. The various estimators or data filters are built to allow some or all of the components of the state vector to vary to optimize the fit to the attitude data, in this manner, systematic errors which give observable effects on the data can be solved for quantitatively and the results can then be fed back to the attitude determintion systems to compensate for these errors and to obtain more accurate attitude results. A detailed discussion of data filters and state estimation techniques is the topic of Chapters 13 and 14. 1. Bevington, Philip R., Data Reduction and Error Analysis for the Physical Sciences. New York: McGraw-Hill, Inc., 1969. 3. Bryson, Arthur E., Jr., and Yu-Chi Ho, Applied Optimal Control. Waltham, Ma: Ginn and Compainy, 1969. 4. Chen, L. C., and J. R. Wertz, Analysis of SMS-2 Attitude Sensor Behavior Including OABIAS Results, Comp. Sc. Corp., CSC/TM-75/6003, April 1975. 5. -, H. L. Hooper, J. E. Keat, and J. R. Wertz, SI RIO Attitude Determination and Control Systems Specifications, Comp. Sc. Corp., CSC/TM-76/6043, Feb. 1976. Window, Comp. Sc. Corp., CSC/TM-76/6210, Sept. 1976. Analysis and Support Plan, NASA X-581-77-169, GSFC, July 1977. /AIAA Astrodynamics Conference, Grand Teton Nat Park, WY, Sept 7-9, 1977. 9. Fang, Bertrand T., "General Geometric Theory of Attitude Determination from Directional Sensing," J. Spacecraft, Vol. 13, p. 322-323 + , 1976. 10. 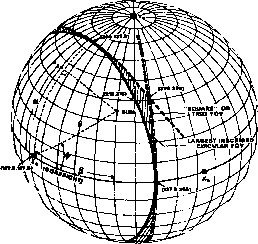 Grubin, Carl, "Simple Algorithm For Intersecting Two Conical Surfaces," J. Spacecraft, Vol. 14, p. 251-252, 1977. 11. Keat, J., and M. Shear, GRECRS Test Results, Comp. Sc. Corp., 3000-06000-02TM, Sept. 1973. 12. Lerner, G. M., and J. R. Wertz, Sun Sensor Configurations for SEASAT-A, Comp. Sc. Corp., CSC/TM-76/6147, July 1976. 13. Rowe, J. N., P. Batay-Csorba, S. K. Hoven, G. Repass, International Sun-Earth Explorer-C (ISEE-C) Attitude Analysis and Support Plan, Comp. Sc. Corp., CSC/TM-78/6082, June 1978. 14. Shear, M., G. Page, S. Eiserike, V. Brown, K. Tasaki, and J. Todd. Infrared (IR) Attitude Determination System Communications Technology Satellite Version System Description, Comp. Sc. Corp., CSC/TM-76/6083, June 1976. 15. Tandon, G. K., M. Joseph, J. Oehlert, G. Page, M. Shear, P. M. Smith, and J. R. Wertz, Communications Technology Satellite (CTS) Attitude Analysis and Support Plan, Comp. Sc. Corp. CSC/TM-76/6001, Feb. 1976. 16. Werking, R. D., R. Berg, K. Brokke, T. Hattox, G. Lerner, D. Siewart, and R. Williams, Radio Astronomy Explorer-B Postlaunch Attitude Operations Analysis, NASA X-581-74-227, GSFC, July 1974. 17. Wertz, James R., and Lily C. Chen, Geometrical Procedures for the Analysis of Spacecraft Attitude and Bias Determinability, Paper No. AAS75-047, AAS/ A1AA Astrodynamics Specialist Conference, Nassau, Bahamas, July 28-30, 1975. 18. -, and Lily C. Chen, "Geometrical Limitations on Attitude Determination for Spinning Spacecraft," J. Spacecraft, Vol. 13, p. 564-571, 1976.